“Fighting Scots” Join RCCN? Would Rachel Approve? RCC President Dr. Robert K. Musil declared to a packed audience of 300 at the College of Wooster in Wooster, Ohio that “Rachel Carson was a “Fighting Scot!” The College of Wooster was founded in 1866 as a co-ed Presbyterian college that now prides itself as America’s premier undergraduate college for mentored, independent research. It also has been named as just one of 40 schools in Loren Pope’s influential book, Colleges that Change Lives. Given its Presbyterian heritage, Wooster’s clubs and teams are called the Fighting Scots. But RCC’s Bob Musil was referring to the fact that Rachel Carson’s grandfather, the Rev. Daniel McLean, was a learned Presbyterian minister of Scotch-Irish heritage who passed on values of deep spirituality and social responsibility to his daughter, Maria McLean Carson. Maria, a former teacher, then passed them on to her youngest daughter, Rachel, introducing her to the nature study movement. It taught children to observe, study, and care for all the creatures they saw outdoors and to care for other people as well. Musil spoke as part of the Great Decisions lecture series that brings noted national figures to Wooster and was in residence as a Woodrow Wilson Visiting Fellow. He was hosted and introduced by Professor Angie Bos, chair of the political science department, and vice president of the Great Decisions of Wayne County. 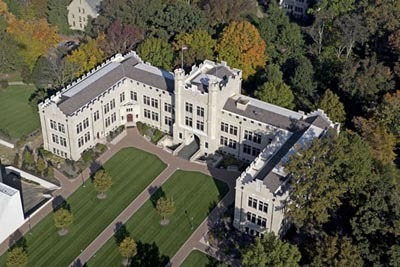 While at Wooster, Musil met with classes in environmental ethics, chemistry, geology, and environmental sociology, as well as meeting with Greenhouse, the student environmental organization, and the student-run Jenny Investment Club that manages $4 million of invested funds based on environmental, sustainability and good governance principals. Dr. Musil also met with the College of Wooster faculty/student/staff standing committee on sustainability and with the Vice President of Business and Finance Dee McCormick and her staff from grounds, facilities, and student affairs most directly involved with campus-wide sustainability planning. The goal was to build on Wooster’s strong record of sustainability and to develop strategies to move Wooster College to the highest levels of sustainability under the leadership of their new President Sarah Bolton, a physicist and former Dean of Williams College. Wooster is currently working to complete its third LEEDS-certified building, a new science center. While at Wooster, President Bob Musil also met with key sustainability executives at the J.M. Smucker Corporation, spoke to the Kiwanis Club, taught a class in AP Environmental Science at Wooster High School, and spoke at The Ohio State University Agricultural and Technical Institute about environmental health and climate issues associated with industrial-scale hog and chicken production.